Session 268. Scored a nice kitesufing session at Hampton in a solid sea breeze on my Firewire board strapless. Its certainly a good feeling having the freedom to place your feet wherever you like on the board without straps. Its nice to fly the fast turning 9m Lithium kite too. After a couple of runs out and back I headed down between the rock groynes for some wave action, then continued on down to Green Point. There are some nice reef breaks on the way there, and the break of Green Point was working too. Gybing the board without straps feels a bit odd for some reason but its not difficult. The Firewire board turns well and feels very secure in the swell. I like it. Going upwind to get back was no problem either, I made it in one tack to complete a nice short tour. I am still getting my head around how to do a duck tack! The log also shows a short session at Gnotuk that I forgot to clear. Session 265. Tarren and I made it to Gnotuk Ave Aspendale where Cesar and a group of fellow kiters training for the 2014 Across the Bay to Conquer Cancer were assembled for a training downwinder. There was very little wind and nobody on the water. I decided to give the Lithium Zero another go. Once again there was not enough wind to go upwind (less than 5 knots? ), and this time the wingtips of the kite were folding in. The bridle attachment on the leading edge seemed to crease the leading edge in. Pulling the rear lines (bar ends) popped it back out but it kept happening. I think the air pressure in the bladder was too low - this may have caused the problem. I swapped over to the Sector 60 board and was immediately screaming along with the kite depowered, but still unable to wrestle it around to point upwind. The northern out and back track log shows this run out and back. The Lithium Zero shows some promise but the wind range of the kite is quite narrow and its not easy to go upwind. I don't think its a suitable kite for beginners. Session 264. After a relaxed breakfast in Inverloch at the Beach Hut cafe, Tarren and I decided to try to the Lithium Zero out in the 5-8 knots of wind in the inlet. It is certainly strange setting up to kitesurf with people pottering about on SUPs and out fishing in canoes. There was enough wind to fly the kite but not really enough to stay upwind. Looking at the water you can see flat glassy sections where there was virtually no wind. The kite flies well but turns quite slowly. Tarren did a couple of runs out and back then I had a go. It was nice to be on the water, but not really what you would call a "cracking session". I tried a relaunch in the light wind and eventually succeeded. Without struts, the leading edge of the kite can trap water which is then difficult to dislodge. I was standing too, relaunching would be much harder if you were floating in the water. In light winds it is best not drop the kite. Tarren was impressed by having a kite in such light wind conditions. We headed back to Melbourne to check out bayside conditions where some stronger wind was forecast. Session 263. Despite the poor wind forecast, Tarren and I got some great wind and sun for a great kitesurfing session in Shallow Inlet. Further up the inlet I was on full power with the Lithium 12 but closer to the mouth I depowered the kite. The water wasn't really flat but I got some nice fast runs down wind. It was an easterly so the wind was onshore. Going up into the inlet the water gets shallow so some caution is required - turning in very shallow water on the surfboard doesn't work! 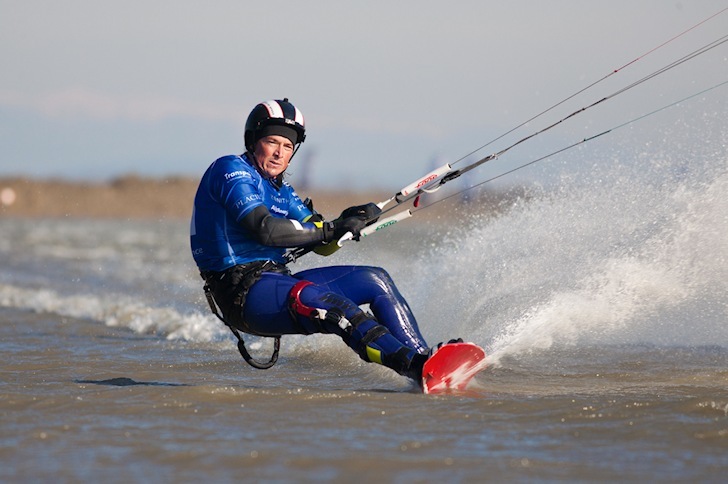 I have finally got to kite at Shallow Inlet after several previous attempts were unsuccessful. Its a great spot, nice and quiet and Wilsons Promontory and the offshore islands in the distance provide a wonderful backdrop. The boat fishermen we passed driving off the sand had some very big catches. We had a look at the Sandy Point surf beach on our way out but there was less wind there. Back at Inverloch there was around 16 knots easterly wind and one guy kitesurfing, but it was low tide so the runs were very short. Not enough wind at the surf beach and it was offshore.